Face ID made its debut with the iPhone X. It seemed the inevitable successor to Touch ID but there was still a ways to go. Now with iOS 12, many concerns have been alleviated. There is a considerable speed improvement while unlocking the iPhone X with Face ID, and if it fails, a swipe up now will re-scan your face. It's much more convenient in both regards. Family members can also now register multiple faces to unlock a single device. Touch ID could handle several different fingerprints, but Face ID was limited to just a single one. This is opened up with iOS 12 where an "alternate ID" can be configured. The app switcher also was a point of contention. It required users to swipe up from the bottom to access, then hold on an app card until an X appeared in the top left corner before they could be closed. Speed, a common thread here in iOS 12, has increased when accessing the app switcher in the update, and apps can be force quit just with a simple swipe up, no longer requiring the hold. Another issue was inadvertently taking screenshots when waking the device from sleep. This wasn't just with the iPhone X, but all of Apple's handsets with the volume buttons directly opposing the side button. Starting with iOS 12, accidental Screenshots can be more easily avoided. If the volume and side buttons are hit simultaneously while the iPhone's screen is off, no screenshot will be taken. If the phone is on, a screenshot will be taken. This should hopefully keep the camera roll free of pics of your lock screen. Lastly, Animojis are getting quite the feature boost. They are now capable of detecting blinks and stuck out tongues. Recording time is also boosted to 30 seconds -- up from 15 -- which should make creating your own Animoji karaoke easier. There are four new characters -- ghost, tiger, T-Rex, and koala -- as well as the fully customizable known as Memoji. Hooray for both of the above! There is a considerable speed improvement while unlocking the iPhone X with Face ID, and if it fails, a swipe up now will re-scan your face. It's much more convenient in both regards. For me, these are huge. Speed of FaceID is particularly a problem in unlocking apps that use it: I hope there's a significant speed improvement there. Speed of iPhone unlocking has been less of an issue for me, although the lack of rescan when swiping-up has been an irritant: glad to see that will be now fixed. I'm curious whether Apple has a second generation FaceID components for the new models. I hope it fixes the bug where a single click of the side button brings up Apple Pay. It's been there since launch and it's super annoying when it happens. iPhone X was super solid day 1. In true Apple form they are continuing to improve many areas to make it even better. This is one of the many reasons why I am a loyal Apple user. iOS11 is SO buggy! I really cant recall any other OS version that is as bad as this one, specially on iMessage and Music. The only feature I would love to see on iOS12 is being able to access control center from the bottom of the scree rather than the top right corner (it's clumsy and unintuitive). I'm struggling to even think of any bugs I encounter in iOS 11. 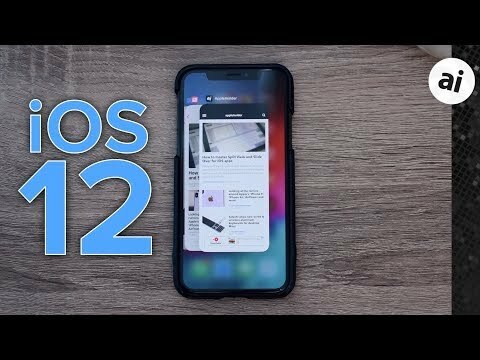 Same here iOS 11 is amazingly stable I’ve run into very few minor annoyances even. It would be interesting to see what iPhones people are experiencing the most bugs on iOS 11. So turn it off in settings. If FaceID fails the first time, I tilt it back (like laying it on a flat surface), then raise it again. It usually always works with that trick. No need to swipe up or enter the passcode. The only time I usually have issues is if it's very sunny. Part of that issue could be the screen protector.